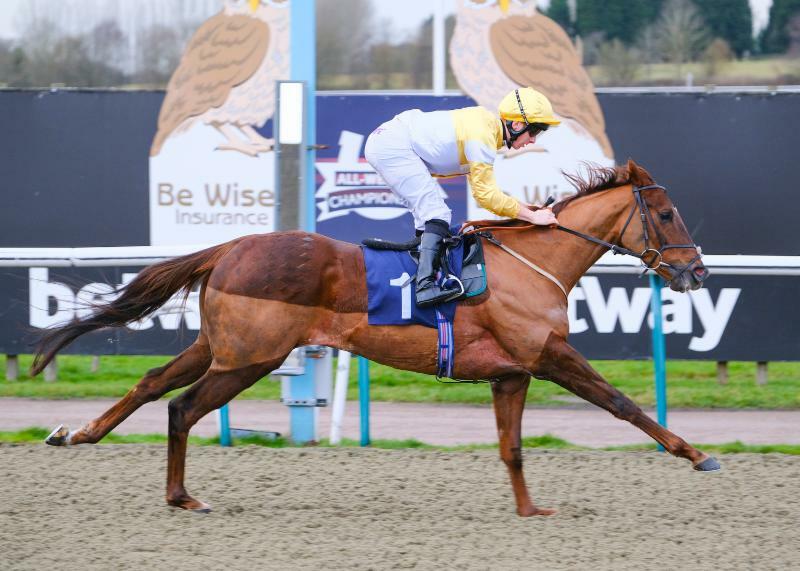 Trainer Archie Watson looks to have unearthed another classy performer after Mango Tango came out on top in a thrilling finish to the Betway Casino Conditions Race at Lingfield Park this afternoon, Wednesday, December 5. The five-year-old mare was making her UK debut, having been trained in France and more recently Qatar, and faced stiff competition with 2014 G1 Breeders' Cup Classic runner-up Toast Of New York (Jamie Osborne/Adam Kirby) and Scarlet Dragon (Alan King/Martin Harley) among her four rivals. Mango Tango has some high-class back form to her name, most notably when second in the G2 Prix de Pomone at Deauville in August, 2016, for leading French handler Pascal Bary. Watson commented: "Mango Tango is a very talented filly and had some very good form in France. "We were second in this race last year with Petite Jack, who went on to win the Listed Quebec Stakes. He was moved away from us during the summer, and I wanted a horse for the Middle-Distance division of the All-Weather Championships. "All the credit must go to Tom Biggs, who buys all of my horses. He found Mango Tango in Qatar and, although it is hard to get a line on the form, she had been winning races out there. "It was a big job shipping her home, for new owners in the yard, and I am delighted she has won today because I am sure she will progress plenty. "She was second in the Prix de Pomone, which is a G2 over a mile and a four furlongs, but I think 10 furlongs is her trip. "There is a great series of 10-furlong races here during the All-Weather Championships. We will go to the Quebec Stakes [on December 22] next and then you have races like the Winter Derby Trial, Winter Derby and Magnolia Stakes at Kempton before Finals Day. "She is already G2-placed but being a very good-looking daughter of Siyouni, who is an outcross, if she can win a Listed race or better, she will be worth a lot of money." Greatrex added: "I am really pleased with Mango Tango. Darren [her groom] rides her every day and has done a fantastic job because she is not the easiest. "I felt like she was just hanging fire slightly turning in. She might have thought she had it won already, but she picked up great and has done it well." Watson is no stranger to success on All-Weather Championships Finals Day, having sent out Corinthia Knight to win last season's 32Red Three-Year-Old All-Weather Championships, and Greatrex also guided that horse to victory at Lingfield Park yesterday, Tuesday, December 4. Watson said: "That was some performance from Corinthia Knight yesterday - I think he ran 120p with Timeform. You would be winning Group races for fun running like that. "He loves the All-Weather. He is only a small horse, but he gave the weight away to a lot of good sprinters who are in-form. "He will be aimed at the sprint final on Good Friday and will run in all the conditions races and Fast-Track Qualifiers on the way there."